Make sense? Probably not. Because working in the service industry comes with its own lingo. Words like 86, working a double, or sidework, for instance, are easily decipherable. But we also regularly use terminology that would require a translator for the average non-service-biz joe. Like “clopin”. That’s short for close-open. It’s what we call it when you work till the wee hours closing the restaurant, and have to be back in a few hours to open up again (which happens painfully often). One of the biggest things in our special language is to communicate every possible movement we make with each step. We constantly broadcast our precise location, with more accuracy than a GPS. With all that helter-skelter, chaotic walking around the kitchen and dining rooms, the staff has to use verbal turn indicators to avoid any unnecessary accidents or potential collisions. You put on your blinker by shouting out location descriptors in order to announce your exact whereabouts at all times. Especially in proximity of another person. Therefore, any restaurant echoes with constant cries of, “Behind you!”, “On your back!”, “On your front!”, or “Corner!”, when rounding a corner. I feel like a garbage truck-- like I’d beep if I backed up. These continual announcements are, of course, so a server with a hot coffee pot doesn’t run into someone else carrying a tray full of bloody mary’s or plates piled with slippery eggs benedict… as to avoid scalding injuries, unneeded mess, or slipping on a slick of hollandaise. This means he needs hands, as in yours, for carrying plates of food to the tables. Get it while it’s hot. Drop what you’re doing, no matter what you’re doing, and come running. Code blue. Never mind that you have 15 people waiting for ice water, five tables that need bread, four cappuccinos to make, and a lady who asked you three times for more cream. Hot food is supposed to be priority number one, and trumps all other obligations you might need to tend to. It’s a stressful interruption, and when you’re busy, one which can really slow down your groove. I naturally pictured some sort of Edward-Scissorhands scenario with a chef whose fingers are fused into bananas at the tips. But there’s no avoiding it. The chefs are nothing if not persistent. I’ve had one tell me, as I was getting ice water for a table: “That can wait! Hot food is more important than water!“ (Try telling that to a man when he’s on fire). And another time after repeated calls for hands, which I ignored in favor of some other pressing task, he snapped at me, “Do you think I’m not talking to you? !” It’s gotten to the point where going in the kitchen at all scares me, and it seems safer to simply stay out of there altogether. Except that that isn’t going to get those cappuccinos made either. 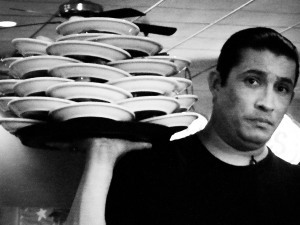 Besides, some chefs, when left “handless” with a bunch of plates on the line needing to be run to tables, will dare venture out of the kitchen to forcefully recruit some poor, unsuspecting (and otherwise-occupied) server: “I need hands, please!” There’s even one cook who is retired military. He knows how to motivate the ranks, since we are all far too frightened to mess with an ex-marine on a rampage for hands. Banana hands. At first I naturally pictured some sort of Edward-Scissorhands scenario with a chef whose fingers are fused into bananas at the tips, peels dangling down to his wrists, clumsily fumbling to torch a crème brulee with his fat banana fingers. 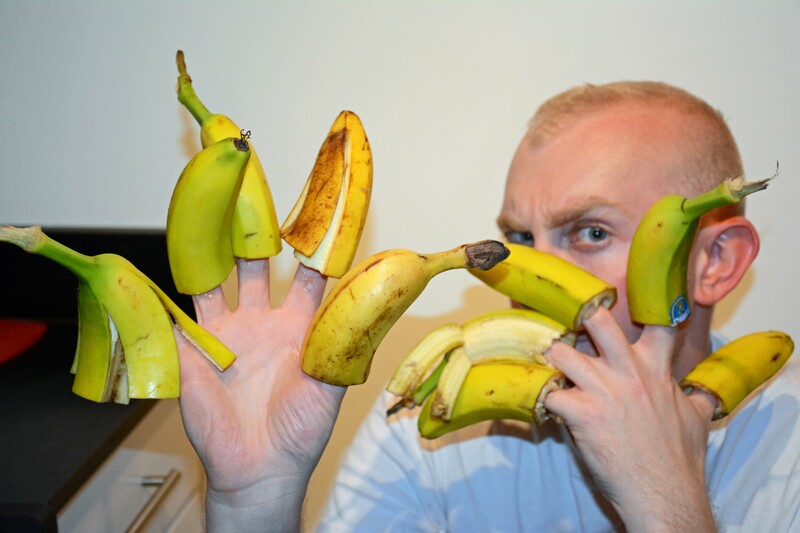 But now banana hands has taken on something of a personality of its own. 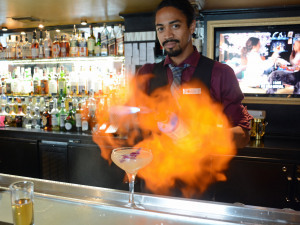 It lives and breathes…fire, of course, as a flambéed dessert would. We have turned Banana Hands into some sort of an evil character from a comic book, or from some cheesy horror flick, who probably preys on bratty children who dare to want to eat dessert before finishing their Brussels sprouts first. Last week I witnessed a coworker talking to the pastry chef in the kitchen, who had just given out the sounding cry for “banana hands”. This server was saying in that creepy, movie trailer voice, “Just when you thought it was safe to walk down Royal Street…Banana Hands!” That same guy also likes to sing any number of songs and jingles, changing the lyrics and filling in instead with “banana hands” where appropriate. There are plenty of tunes that work. Like, “He’s got the whole wide world, banana hands…” Or, ZZ Top’s Sharp Dressed Man: “They come runnin’ just as fast as they can, cuz every girl’s crazy ‘bout banana hands…” The possibilities are endless. A very profound observation indeed.